View restaurants that deliver food to your location on the Yelp Eat24 App. Restaurant logos do not add much useful information for users. It's difficult to identify what food/cuisine a business serves at a glance. Highlight featured food images for businesses to increase quicker cuisine recognition amongst users. Initial wireframes exploring a more prominent position for featured restaurant images. Businesses with featured food images are much easier to visually process what type of cuisine they serve without having to think or actively read the restaurant card. 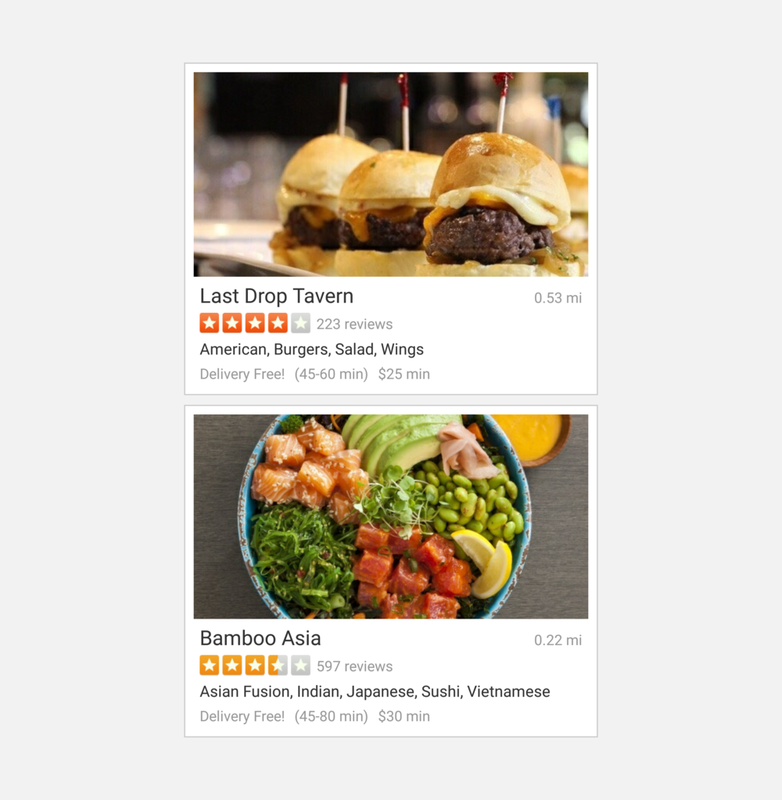 The new cards pair business details and featured food images to communicate both a quick cuisine context as well as detailed information to users as they browse restaurants on the Yelp Eat24 app. Check the delivery status of your food on the Yelp Eat24 App. Order status does not have a clear focal point, and surfaces too much information all at once. With three buttons and multiple times displayed, order status is confusing to users. Create a clearer information hierarchy and design a sense of progression for order status. Progression expressed through segmented bars, cards and timelines. The estimated delivery time (3:50pm) is too disconnected from the rest of the page. The new page removes multiple times, buttons and an excess of distracting colors to prioritize the current order status and the estimated delivery time.